Shortly after tweeting about fake news regarding his 2005 tax returns, Donald Trump turned his attention to more important news: a rapper’s music video. 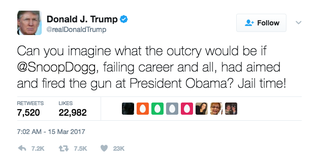 Apparently, Trump has finally gotten wind of Snoop Dogg’s video for “Lavender,” which depicts Trump as a clown president (life imitating art) with Snoop aiming a gun at his head. Also, let’s not forget how people literally sent death threats to Barack Obama when he was in office (and probably even now that he’s out), or those times when people thought it was fun to hang images of him in effigy. But of course, Trump would consider all of that fake news. Snoop Dogg’s last appearance on social media included a selfie about five hours before this posting; something tells me he’s going to have a few words for Trump later today. Maybe Trump can remember the good times he had with his dear old friend.